Olive died on Sunday morning 12.7.2015. When Olive could not attend a meeting for worship, it was her custom to hold us in our thoughts and prayers. So we hold her. A memorial was prepared by Olive's niece Lesley Hall which uses photographs and memories. It is to be used as the base of a memorial on this website. I was born in 1926. My mother and father, Beatrice and Bertie Jenkins, were members of the Quaker meeting at Bunhill Fields. Until 1939 we lived at 14 Kent Street, just near Queensbridge Road, E8. This house was demolished by a landmine in 1940. Many Sundays in my Quaker childhood were spent at Hoxton Hall. I cannot say exactly when we worshipped at Hoxton Hall, and when at Bunhill, as I do not have the records to check. Generally we attended Bunhill Fields Meeting for Worship in the mornings. 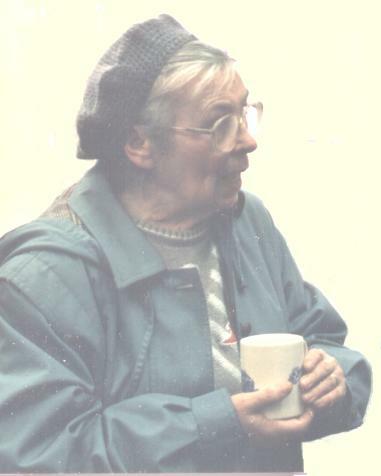 I and my sisters had a children's class in which Florence Lee, May Mortimer and Mand Westover took turns to tell us Quaker history and Bible stories and usually the last quarter of an hour we went into worship. Sometimes we attended evening meeting. As it was a long way for us to walk to Bunhill Fields, it was suggested we went to the centre at Hoxton Hall where Quakers were taking classes and not so far for us to walk. The building was first a Music Hall, then taken over by the White Ribbon Army (Society) who were strictly teetotal. I signed the pledge when I was about 10 years old [about 1936], so I guess the White Ribbon was still active. As you can see I was well occupied: Morning meeting 11 to 12; Sunday School 2 to 3.30; Children's Service 5 to 6; Evening Meetings 6.30 to 7.30 and a meeting called "At Home" from 8 to 10. We three girls went to the Sunday School at Hoxton Hall in the afternoon and our mother and father went to the evening service which was held in the large hall. Edward Bellamy used to give the sermons. He was a member from Barnet Grove. There were other Quakers and helpers. Bernard Moss and a Mr Wilks (he may not have been a Quaker) also helped. Alice Cooper and her family, the Chishams, of the White Ribbon were active in the choir. The service was usually hymns, prayers, Bible readings, solos from the choir and a sermon. There were special services including the Harvest Festival where fruit and vegetables went to the old, needy and St. Leonard's Hospital. There was also a Christmas Carol Service. The "At Home Service" was held in the parlour. There was a small kitchen on that floor. After Evening Service, the older folk climbed up several flights of stairs and were rewarded with a cup of tea and a biscuit; then settled down to a few hours of classical music, poems, singing, story telling etc. There was plenty of talent amongst Hoxton Hall folk and they all gave their services freely. Once a month it was expected to be a youth service and all members of all the clubs held in the building were expected to attend and partake. There were lots of activities going on. Boy's Clubs were held in the basement. There was a Penny Bank where most people put away for Christmas, but as they were mostly poor, they withdrew as soon as a few shillings amounted. The Men's Clubs were usually billiards. The Guild of Good Life had junior and senior groups. I was in the Junior Group. This met in the Stewart Hall on the ground floor. They had long trestle tables and long forms in groups. Here you could choose what you wanted to do, such as knitting, painting, embroidery, patching clothes, darning. In one corner there was a reading class for children who were unable to attend school for family reasons. At the end of the year a concert was given in the large hall and silver medals were given to children for good behaviour and attendance. I have three, so I must have done well. I went to Brownies when I was about eight years old [about 1934]. It was the second Hoxton Guides and Brownies. Florence Bennett was Brown Owl and captain. I learnt to cook and make tea, tie knots, observe my neighbourhood and know where the nearest pillar box, hospital, fire station, police station etc. was. There was also knitting. I must admit that this put me in good stead. I was taken ill on the way home from Brownies one day. The Tawny Owl and one of the guides found me and took me home. The next day I was in the Children's hospital in Hackney Road, seriously ill, after an operation. I was there six months. In that time prayers were offered and many visitors came. As I grew better in health I was given wool and encouraged to knit mittens and socks for the babies in the hospital. At Christmas that year I was given a ticket to attend the Lord Mayor's Banquet at the Guild Hall. This was a gift from Hoxton Hall for recovering from a long illness. There was also a Senior Choir and a Children's Choir. This was usually on Thursday evenings. Mrs Childs arranged this and Irene Stone from Stoke Newington meeting played. In fact, Irene played for all meetings. Her husband, Walter was active in the boys' and mens' clubs. The choir sang once a month for Evening Service and every week at the Children's Meeting on Sunday evening held in the Stewart Hall. There was a Senior Club "The Quest" run by Ernest and Elise James. It was over 16's, mixed. They ran a programme of many sports, dances, swimming, music and discussion. My sister Marjorie joined. Sea rangers was started by Florence Bennett and Grace Sturge of Hampstead meeting. My sister Muriel went out with all the rowing boats on local ponds and canals. Then on Saturday nights the old Music Hall was open for entertainment, local dance troupes and a theatre group. I believe it was about 3p for adults. I cannot remember prices exactly but there was something to pay at the entrance. John Wright and his wife sat and collected money. John was blind but his hearing was excellent. They were Bunhill Fields members. There were days for each club; bazaars where the workers sold their goods; outings from Sunday School usually to Southend-on-Sea. We used the railway (specially arranged from Shoreditch Station - now closed). Later we had buses to take us to Hastings. The older folk had outings. Brownies and Guides arranged their own treats. The Hall was open seven days a week for various activities. Hoxton was a very busy market and many of the stall holders either gave time, goods or kept an eye on the building. It was a very poor area and Stanway Street was very overcrowded and rough. Even the police went down this street in twos and threes. The Queen Mary Hostel next door had a place somewhere in the activities of the hall. At one time out-of-work miners were housed. During the war nurses were housed there. In 1940 the air raids started. The young men were called up. Our house was damaged by a land mine, and we went to our aunt's in Wiltshire. We stayed 10 months in Wiltshire. On our return most of the activities at the Hall had closed. Edward Bellamy had gone to Norfolk. 1941. Bombing had eased. So a few of the Hoxton folk got together to start a Sunday School. I was old enough to take an infant class. So with a little help with teaching skills, I had a class of 6 children. Things generally were improving. Children and parents were coming back from evacuation. We had a school of about 200 children. Then one Sunday events went badly. We were left outside. Nobody had a key. The following week the children and parents were told that we could no longer use the Hall, and the children could go either to Shoreditch Church, St. Anne's or Costers Hall. I went with the children who wanted to go to Costers Hall. Ernie and I were married at Bunhill Fields meeting House (Yes. In the now Warden's Flat. That floor was used for meetings) on 24.1.1953. We then lived at Greenwood Road until 1966 when we came to South Woodford. I remained a Sunday School teacher at Costers Hall until 1956, when the Minister changed and Sunday School was to be held in the mornings. Being faithful to our small Bunhill meeting, I had to give up Costers Hall. The same year I became Clerk to Bunhill Fields Meeting. It was a small meeting, so I had to wear many hats. I was also married and still working. While Bunhill Fields Meeting House was being repaired during the 1970's, our Meeting for Worship was held either in the hostel or Hoxton Hall. Michael Sorenson arranged our use. I carried on as Clerk for nearly 33 years ending when I was ill and travelling became difficult.